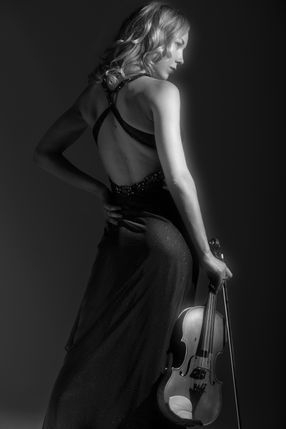 Dunja Lavrova is the Peggy Lee of the Classical Violin. Expect the lyricism and sentiment of Hollywood’s vocal legends of the early 20th century combined with the virtuosity of classical violin. Dunja is joined by The Hot Three, a swinging jazz trio which will make you bounce in your seat. “Dunja Lavrova and The Hot Three” bring together the styles of music which defined the early 20th-century’s “Golden Age of Hollywood”. Drawing from those great traditions - including the Golden Age of Violin Playing, MGM Musicals, Jazz and Big Band - these young musicians reimagine the period. with a female violinist at the front of the stage. Award-winning classical violinist Dunja Lavrova is joined by her sought-after colleagues from the jazz world - Will Bartlett (piano), Laurence Ungless (bass) and Matt Skelton (drums) - in a unique multi-style fusion which blends various genres and eras, with unmistakeable class. Jazz and Big Band standards, as well as famous songs from classic Hollywood movies - which are all given a unique makeover. This is music which brings various styles and types of audience together. The programme promises to please the more experienced audiences of both classical and popular musical genres, who will recognise the songs and compositions, whilst attracting new audiences with the introduction of those classics in a modern light, with a gently-swinging groove. This music will move you: both emotionally and physically.